Here’s hoping you have your tickets for the Museum Miscellany which is at 7.30pm on 14th September. You can get tickets from the Post Office in the village. One section will be about the people of both church and chapel. These organisations made up what was once a truly central part of rural life – and still does for many. The people were the ordinary village people, some rich and some poor, old and young. Today we look mostly at youngsters although they’ll all be over 60 now, for the photo dates from 1955. It features members of the church Sunday School, out in the village for Rogation Day. This merry band of youngsters, all wearing Sunday best clothes, are under the watchful gaze of their Sunday School teachers. At the left is Daphne Arnold. In the middle at the back we have Gwen Cooper and second right at the back, half hidden is Miss J Saxton. 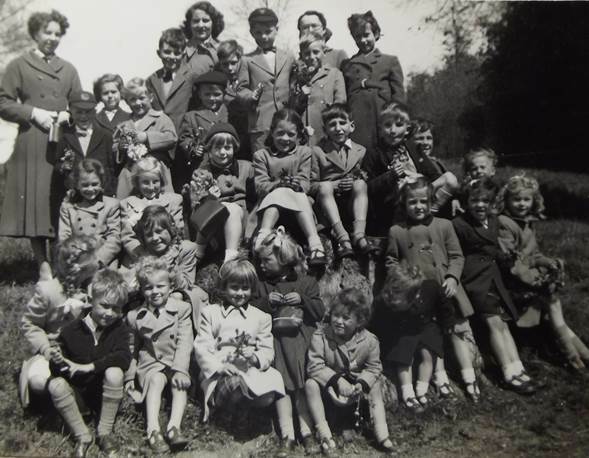 We seek the names of all of the children – maybe you can help us. This and many other photos will be on display at the miscellany and between the two halves of the show we will have our famous museum food for the audience to sample.